Let’s have a look at two particular principles that underpin ALEC’s approach to professional development and training. Hopefully, they are principles that you can adopt as your own. We think they really set the scene for the work that we’re about to do. Here’s the first one. 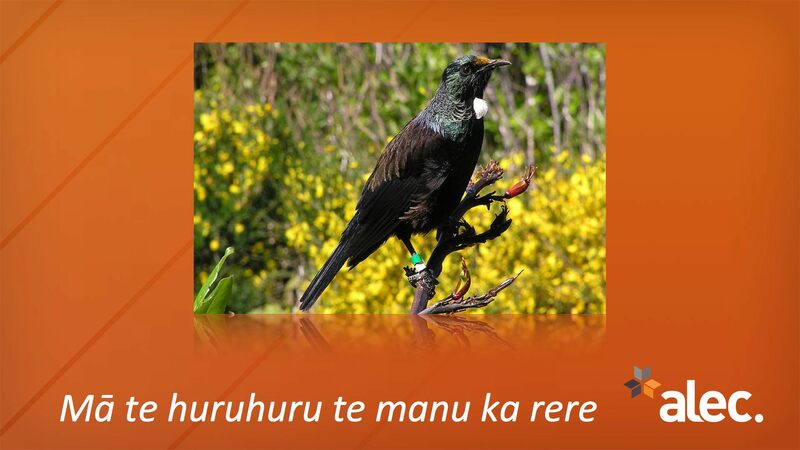 It’s a Māori proverb or whakatauki. One of our graduates, an experienced Māori educator, suggested this to me awhile ago when we were preparing to present a workshop at a conference. We were supposed to be discussing ways in which tutors could use approaches and methods from traditional Māori approaches to teaching and learning. The proverb stuck in my head and helped me rethink what I actually did as a trainer. There are several ways of translating it, but here are two that we’ve used in English to help with our own understanding of what we do and what this training is about. With feathers, a bird can fly. With the right support and resources, the right skills and strategies, you will succeed. The first is a kind of literal translation. The second is a more dynamic translation. Both speak about trainers and training, and together they work on a couple of different levels. On one level, you’re the bird. In fact, we’re all the bird. In seeking out professional or personal development we are acknowledging that we need feathers… We need the skills and strategies in order to succeed at our jobs. On another level, if you are involved in training others yourself, or you have staff that do training, then your learners are also the bird. Often those we teach and train have been battered by the winds and storms of life, and are in need of a place of calm and rest. Your training might be that place of restoration and growth. Or at least it should be. Have a think about it. Specific, Measurable, Achieveable, Realistic, and Timebound. This idea of SMART training is really important for embedding literacy and numeracy. The SMART acronym often pops up in connection with goal setting. And goal setting is something that you’ll need to do at various points in your training with us. This could be in relation to the learning goals that you negotiate with your learners once you have determined their starting point. Or, it could be in relation to the specific learning outcomes that you will formulate to ensure that your teaching is highly focused on addressing the learning gaps of your learners. Designing purposeful learning that solves problems for people and organizations is among some of the most fulfilling work you can do. Not only is it fulfilling for you as the trainer or teacher, but we know from our experiences that it can be transformative, both for you and for those you work with. Prev Foreword and Backward… What’s next for ALEC?